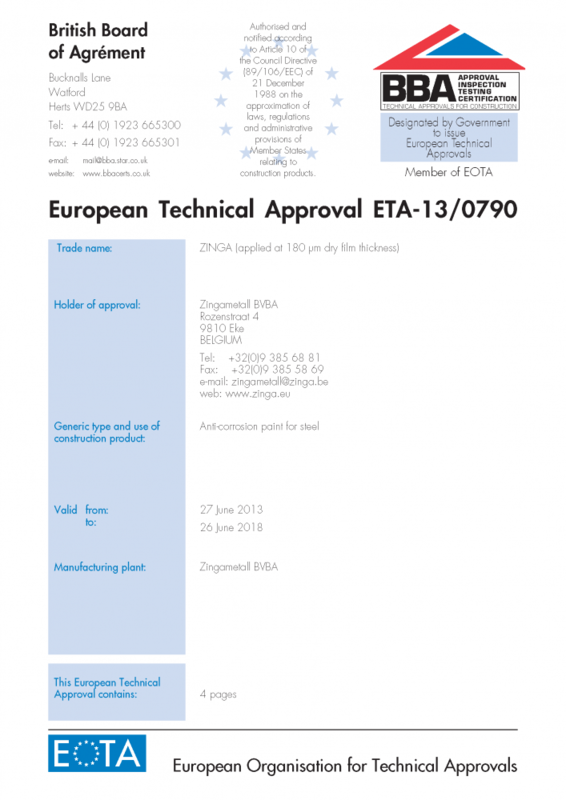 After evaluation of the product specifications (adhesion, contents of metallic zinc, solid contents by mass, flash point, density) and its reaction to fire (heat release, smoke production), ZINGA received the approval from EOTA (European Organization for Technical Approvals) and its ETA certificate number. As a result, ZINGA can display CE marking. ETAs are “a favourable technical assessment of its fitness for an intended use”, and are designed to reduce technical barriers in the construction products sector throughout Europe. Once a building product has an ETA certificate, it can display the CE mark and can be sold Europe wide.